The Ed Voyles Auto Group has been giving away prepaid car leases to local teachers of distinction for close to a decade, and in 2014, the group gave them to five exceptional teachers from the surrounding Cobb County and Marietta City school districts. It expects to do the same in 2015. According to Pete Richards, general manager of Ed Voyles Honda, the idea of giving free vehicles to top teachers stems from a Teacher of the Year luncheon some Ed Voyles employees attended in 2003. 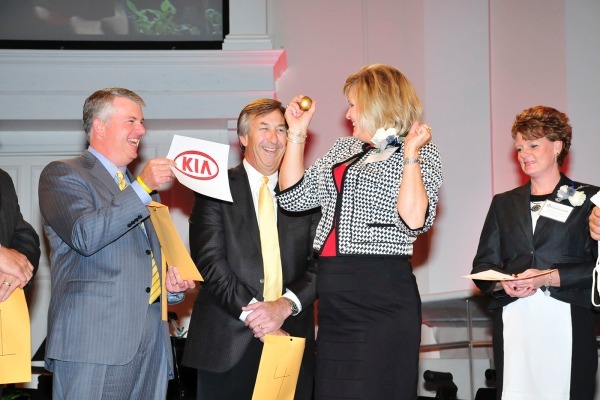 At an awards ceremony, each instructor, who has been honored as a teacher of the year in their district, draws a numbered ball from a paper bag, and the number on the ball corresponds to the brand from which the teacher will choose. There is a ball for each Chrysler, Honda, Hyundai, Jeep Dodge Ram and Kia store. The teacher is free to pick any new vehicle out of inventory, regardless of price, to have as their free car for the year. The dealer group pays the taxes and fees for each winner’s vehicle, and also covers the prices of the vehicle services.